The international conference on Neuroadaptive Technology will be held on the 16-18th July 2019 in Liverpool. This will be the second meeting on this topic, the first took place in Berlin two years ago. You’ll find a link at the top of this page for the schedule, registration costs and other details about the meeting. In this short post, I’d like to give a little background for the meeting and say some things about the goals and scope of the conference. The original idea came from a conversation between myself and Thorsten Zander (my co-organiser) about the absence of any forum dedicated to this type of implicit closed-loop technology. My work on physiological computing systems was always multidisciplinary, encompassing: psychological sciences, wearable sensors, signal processing and human-computer interaction. Work in the area was being submitted and published at conferences dedicated to engineering and computer science, but these meetings always emphasised one specific aspect, such as sensors or signal processing aspects or machine learning. I wanted to have a meeting where all aspect of the closed loop were equally represented, from sensors through to interface design. On the other hand, Thorsten had developed concept of passive brain-computer interfaces where EEG signals were translated into control at the interface without any intentionality on the part of the user. We had at least two things in common, we were both interested in closed-loop control using signals from the brain and the body and we were both frustrated that our work didn’t seem to fit comfortably into existing forums. Thorsten took the first step and organised a passive BCI meeting at Demelhorst just outside Bremen for two (very hot) days in August 2014. On the last day of that meeting, along with the other attendees, we batted around various names with which to christen this emerging area of work. If memory serves, I don’t remember anyone coming up with a label that everyone in the room was completely endorsed. The term ‘neuroadaptive technology’ that I appropriated from this 2003 paper from Lawrence Hettinger and colleagues was the one that people were the least unhappy about – and so, when it came time to organise the first conference, that was the name that we ran with. From the beginning, we decided to make the ‘neuro’ in the title of the conference as broad as possible, encompassing psychophysiological sensors/measures as well as those derived from neurophysiology. At that first conference, we also wanted to draw attention to the breadth of work in this field and so we invited Rob Jacob as a keynote to talk about new modes of human-computer interaction and Pim Haselager to address the ethical implications of the technology, as well as speakers on EEG signal processing. A full list of abstracts and the schedule for that 2017 meeting is available here. The fundamental thinking behind the neuroadaptive technology conference is that despite the significant range of applications under consideration in this field, which runs from autonomous driving to marketing, researchers share a significant number of interests, such: sensor design, signal processing methods in the field, machine learning for classification, designing implicit modes of human-computer interaction, establishing methodology for evaluation – and that’s far from an exhaustive list. And so, in Liverpool this July, we’ll be doing it all again with a wide range of speakers from around the world. The deadline for abstract submission is 31st March 2019 and we’re in the process of organising keynote speakers and a clear route to publication for the work presented at the conference. Full details will appear at the link from the top of this page over the next few months. A quick post to alert people to the first forum for the Community for Passive BCI Research that take place from the 16th to the 18th of July at the Hanse Institute for Advanced Study in Delmenhorst, near Bremen, Germany. This event is being organised by Thorsten Zander from the Berlin Institute of Technology. Last week I attended the first international conference on physiological computing held in Lisbon. Before commenting on the conference, it should be noted that I was one of the program co-chairs, so I am not completely objective – but as this was something of a watershed event for research in this area, I didn’t want to let the conference pass without comment on the blog. The conference lasted for two-and-a-half days and included four keynote speakers. It was a relatively small meeting with respect to the number of delegates – but that is to be expected from a fledgling conference in an area that is somewhat niche with respect to methodology but very broad in terms of potential applications. I attended a short conference event organised by the CEEDs project earlier this month entitled “Making Sense of Big Data.” CEEDS is an EU-funded project under the Future and Emerging Technology (FET) Initiative. The project is concerned with the development of novel technologies to support human experience. The event took place at the Google Campus in London and included a range of speakers talking about the use of data to capture human experience and behaviour. You can find a link about the event here that contains full details and films of all the talks including a panel discussion. My own talk was a general introduction to physiological computing and a statement of our latest project work. It was a thought-provoking day because it was an opportunity to view the area of physiological computing from a different perspective. The main theme being that we are entering the age of ‘big data’ in the sense that passive monitoring of people using mobile technology grants access to a wide array of data concerning human behaviour. Of course this is hugely relevant to physiological monitoring systems, which tend towards high-resolution data capture and may represent the richest vein of big data to index the human experience. If there is a problem for academics working in the area of physiological computing, it can sometimes be a problem finding the right place to publish. By the right place, I mean a forum that is receptive to multidisciplinary research and where you feel confident that you can reach the right audience. Having done a lot of reviewing of physiological computing papers, I see work that is often strong on measures/methodology but weak on applications; alternatively papers tend to focus on interaction mechanics but are sometimes poor on the measurement side. The main problem lies with the expertise of the reviewer or reviewers, who often tend to be psychologists or computer scientists and it can be difficult for authors to strike the right balance. For this reason, I’m writing to make people aware of The First International Conference on Physiological Computing to be held in Lisbon next January. The deadline for papers is 30th July 2013. A selected number of papers will be published by Springer-Verlag as part of their series of Lecture Notes in Computer Science. The journal Multimedia Tools & Applications (also published by Springer) will also select papers presented at the conference to form a special issue. There is also a special issue of the journal Transactions in Computer-Human Interaction (TOCHI) on physiological computing that is currently open for submissions, the cfp is here and the deadline is 20th December 2013. I should also plug a new journal from Inderscience called the International Journal of Cognitive Performance Support which has just published its first edition and would welcome contributions on brain-computer interfaces and biofeedback mechanics. First of all, apologies for our blog “sabbatical” – the important thing is that we are now back with news of our latest research collaboration involving FACT (Foundation for Art and Creative Technology) and international artists’ collective Manifest.AR. To quickly recap, our colleagues at FACT were keen to create a new commission tapping into the use of augmented reality technology and incorporating elements of our own work on physiological computing. Our last post (almost a year ago now to our shame) described the time we spent with Manfest.AR last summer and our show-and-tell event at FACT. Fast-forward to the present and the Manifest.AR piece called Invisible ARtaffects opened last Thursday as part of the Turning FACT Inside Out show. I am one of the organisers for a workshop event at ICMI 2012 entitled “BCI Grand Challenges.” The deadline for submissions was this coming Friday (15th) but has now been extended until the 30th June. Full details are below. 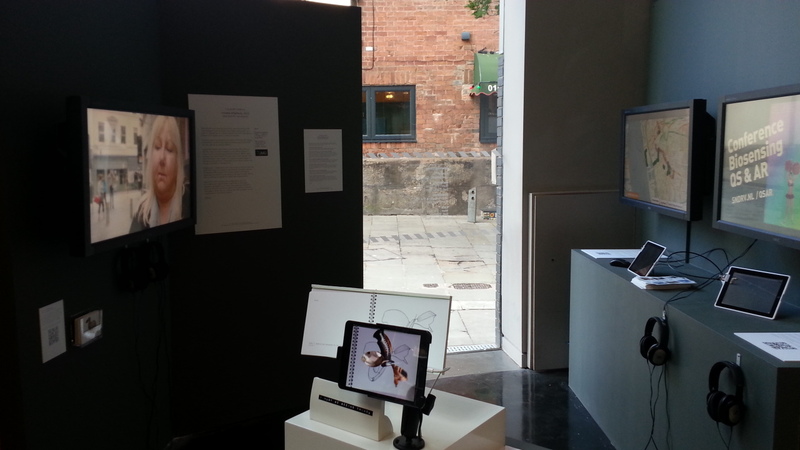 Way back in February, Kiel and I did an event called Body Lab in conjunction with our LJMU colleagues at OpenLabs. The idea for this event originated in a series of conversations between ourselves and OpenLabs about our mutual interest in digital health. The brief of OpenLabs is to “support local creative technology companies to develop new products and services that capitalise upon global opportunities.” Their interest in our work on physiological computing was to put this idea out among their community of local creatives and digital types. I was initially apprehensive about wisdom of this event. I’m quite used to talking about our work with others from the research community, from both the commercial and academic side – what makes me slightly uncomfortable is talking about possible implementations because I feel the available sensor apparatus and other tools are not so advanced. I was also concerned about whether doing a day-long event on this topic would pull in a sufficient number of participants – what we do has always felt very “niche” in my view. Anyhow, some smooth-talking from Jason Taylor (our OpenLabs contact) and a little publicity in the form of this short podcast convinced that we should give it our best shot. Anton Nijholt from University of Twente and Rob Jacob from Tufts University are organizing a special session at ICMI 2011 on “BCI and Multimodality”. All ICMI sessions, including the special sessions, are plenary. Hence, having a special session during the ICMI conference means that there is the opportunity to address a broad audience and make them aware of new developments and special topics. Clearly, if we look at BCI for non-medical applications a multimodal approach is natural. We can make use of knowledge about user, task, and context. Part of this information is available in advance, part of the information becomes available on-line in addition to EEG or fNIRS measured brain activity. The intended user is not disabled, he or she can use other modalities to pass commands and preferences to the system, and the system may also have information obtained from monitoring the mental state of the user. Moreover, it may be the case that different BCI paradigms can be employed in parallel or sequentially in multimodal (or hybrid) BCI applications. The second workshop on affective brain-computer interfaces will explore the advantages and limitations of using neuro-physiological signals as a modality for the automatic recognition of affective and cognitive states, and the possibilities of using this information about the user state in innovative and adaptive applications. The goal is to bring researchers from the communities of brain computer interfacing, affective computing, neuro-ergonomics, affective and cognitive neuroscience together to present state-of-the-art progress and visions on the various overlaps between those disciplines.